The Creek has Life in it. Well I gave it one last shot today, and was shocked. The creek had life in it!!. For the first time in about a month and a half I can say, “Eagle Creek has fish in it again”!. I don’t know if the fish are all throughout the creek, or just located around the top end, near the hatchery. I went out today sometime around 3 O’clock this afternoon. Within 2 minutes I was hooked up with a nice 15 pound winter. Then soon after I hooked another smaller fish, that still had some really good color, (The first fish was dark, but still gave a good fight). So to any of you out there reading this, if you have the chance take a look at the Creek and see if you can get some of these late winters, and remember there are some 20 pound natives that return this time of the year. My friend Dave Hickman from Idaho came up for the week. Me and Dave have been friends now for about 25 years. We grew up and cut our teeth together on some of our first Steelies on the fly rod. We also spent years fly fishing together for Kings and Silvers. Even though he hasn’t seen the Creek since 1997, you can see by the pics that he still has it. Nice to have you back for a bit Dave!! Good Luck Out There And Have Fun!!!!! Sometimes you get just the right picture, but for the most part you struggle to get that perfect shot. Some photographers shoot just a few shots and try to make something out of it, and some just shoot until their thumb is numb. Some of these photographers don't really know what they are doing, and are just taking as many pictures as possible hoping to get just the right one. Few photographers spend the time to get to know the subjects they are shooting, and wildlife can be a difficult subject to shoot even for a pro. I have been very lucky in the short amount of time that I have been capturing fish on film. 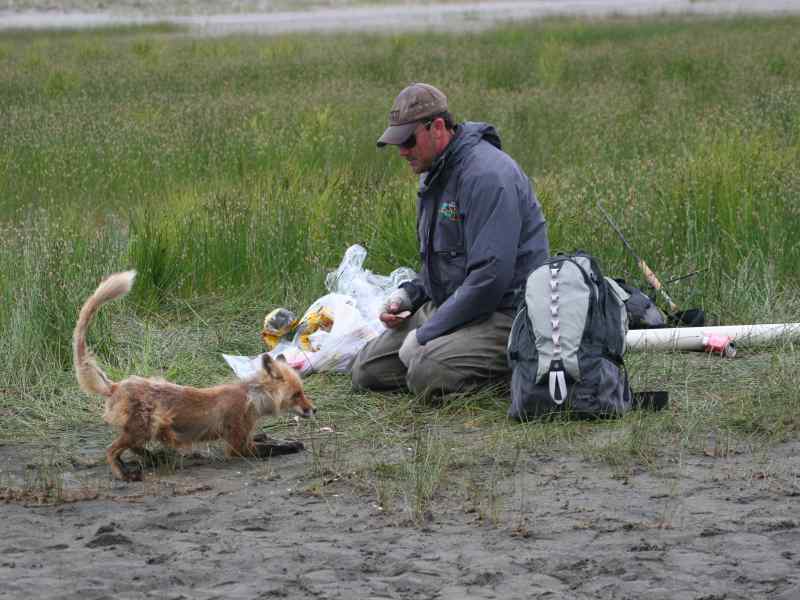 About 6 years ago while starting out in Alaska, I met an individual with a passion similar to my own. I have always been a fisherman since my first Steelhead at a very young age. My passion for Steelhead has taken over my life, and I there is little to no time in each day that I don't sit and think about these wonderful creatures. I am always plotting on how I can change things up just enough to fool one more fish. Maybe alittle green, mixed with pink and white will do the trick today. I often think in multicolors when I am out fishing. If a Steelhead is keying in on orange that morning, and I am throwing peach at them, I probably won't get a strike. By mixing pink, orange, and peach together, I have three times the chance that one of those colors will be the correct one. So I often pick two or three colors together that I know work on there own, as well as in combinations. Before I get lost here, lets get back to my photographer. Like I was saying, it takes a special passion to film still life photography. Soon after meeting with Brian Woobank (Of Seattle Wash.) we both knew what we would be doing together. I am still amazed now after 6 years, at the patience Brian has to wait for the right shot. I always thought that was what was happening over there under the umbrella, or off on the other side of the bank, while he just sat covered by his lenses, and his camera, always at the ready up to his eye, finger on the trigger. Well I could not have been more wrong. While I am fishing, or if I am helping out a client with a big fish, Brian is clicking away in the background. Unlike others who just click away randomly, Brian is systematically catching all any action taking place within the view of the lens. The most spectacular shots are not those cover shots, and they are not those pictures of fish five feet in the air, (Although Spectacular, and the ones the people want to see),it's the ones that show the reality of what has taken place. I am talking about sequence's that show the entirety of the whole event. I have the utmost respect for my photographer and the patience he shows every time we venture out, not only the patience to deal with the weather and the fish, but the patience to deal with a Steelhead fisherman. Now after 6 years, we have been published in Salmon Trout Steelhead Mag. (Grey Ghosts, Dec. 2006) Fish Alaska Mag. (Cover Jan. 2008) , and I am proud to say that Brain has the cover for Fish Alaska again for next months May 2008 issue. Although it hurts that I am not the fisherman holding the fish, cud-dos to you Brian, see you in May. Here are a couple of the sequence shots from the last couple king trips, July 2007. The Natives are coming? I Think!! Well to those who are waiting for the Eagle Creek natives they are still a no show. Recent conversations with the hatchery staff have led me to beleive that if the natives do show it will not be until April. The run came early this year and that was that!!! Gene, at the hatchery said that around 35 fish entered the trap at the hatchery since the 10th of the month. The good news is that the fish that are arriving seem to be in good shape still, leaving me to hope that there are still groups in the Clackams River just waiting to shoot up. The cold water may be the biggest factor in the late arrival of the natives. With warming waters will bring new fish in and the natives will show up then also. On the other hand, this is the year of the return of the Chinook into the creek. Five years ago there were 60 thousand smolt dumped in at the Eagle Fern park just above the first ladder. Since then the number of smolts released has increased, and the dump site has been pushed up the creek to a private landowners property just below the hatchery. So eventhough all the Chinook may not return all the way to the hatchery this year, you can bet on a good run next year, since the number of smolts has gone up to 200,000 for the last 3 years. So look for the big boys to return soon. Well it seems that Eastern Washington has a few secrets to hold. I spent the last four days fishing for Rainbows, Browns, and Tiger trout out of a pantoon boat with my dog in tow. There is a gathering at Lake Lenice every year for the opening weekend of trout season in Washington. This was my first shot at fishing in this manner, and I have to say I was more than skeptical. Being from the background of fishing moving water, this still water fishing can be an intimidating task for a Steelheader. Along with the still water comes the light line, the light rods and reels, and most of all the small number 14 and 16 hooks. To a Steelheader this is like microscopic surgery. The first morning was the start of several surprises to come over the next few days. First of all I was up and ready to fish at 6 AM, the rest of the crew slept until 8 AM. I couldn’t understand what the heck was taking so long, so I headed over to my photographers trailer, (Brian Woobank) to see what the hold up was. After waking him I was shocked to see him roll over and seeing the clock reading just 7:30, he just rolled over and said “the hatch won’t start for another few hours, go back to bed”. I couldn’t understand this, but I just waited to see what the rest of the day would bring. After a reasonably good breakfast of sausage, eggs, toast and coffee, we were on our way to the lake. The walk to the lake is a fairly short 10 minutes from the camp. Making the camping area off the banks of the lake make it alot less accessible and leave it open for fisherman to find a good spot to fish, even when it’s busy. We geared up with waders, flippers and pantoon boats and headed into the lake. The fly of choice is the chrominid,which is a pupi stage of a mesquito. Not a big lake in size, it offers some very large browns and Tigers, with the rainbows reaching about the 28 inch mark. The first day I spent 3 hours on the lake from 9 to 12 with no luck at all. So I headed back to camp and had some nice camp style hot dogs for lunch and relaxed for about an hour before heading back out to try again. At this time I was sure that this was not for me. As I walked down the trail to the lake I started thinking that I fish for Steelhead and that’s just a big trout. So upon getting to the lake, I scanned to bank line and made a decision to fish in a spot that I had seen another fisherman in earlier. The other fisherman was Capt. Larry from Pacific Yacht Instruction and guide services. Knowing that he must know what he was doing, I decided that it looked fishy and so I paddled over and dropped the anchor. Working with the smaller gear was a bit of a challenge at first, but within an hour I was on it and doing fairly well. Within ten minutes my indicator went under, and I lifted up on my first ever bow on a chromonid. I expected to just bring this fish to the boat no problem, but another surprise hit me when this bow took half my line before I even knew what happened. I had to play him with kid gloves and be very gentle, or the 2# test I was using would snap with just the slightest bit over tension on the line. I landed that fish and 6 others the first day out, this was the third surprise, I didn’t think this could grab me the way it has, and I will now start my studying of the world of trout and bug fishing. Stay tuned for what the second day brought………………………………..
To all those reading this, I am going to be in Eastern Washington this week for Rainbows and Browns. I will be out of the area to add any new entries, but I will be writing an article for Salmon Trout Steelhead magazine. I will also be writing about it on here starting Saturday. Hopefully there will be some of you out there waiting to read. I am also heading back to Alaska on the 1st of April. Once I am there I will be writing daily reports from there and telling all of you where I will be next, if I have it my way, I will be on a beach in South Africa fly fishing for Rooster fish. That is only a dream for now though, so I will be in Yakutat, AK for the next six months as of April 1st. See ya all this weekend. Well the fishing is slow and the information is limited to the movement of fish, so it's time to tell you how I started fishing and the things that have happened to me along the way. It's been along journey getting to where I am today. So I would say it all started back when I was about 5 or 6 years of age. My Dad would take me and my brother out fishing for whatever we could catch, mainly cat fish along the Columbia George and in the Snake river. One of my most memorable moments of being a kid out fishing took place one day when we were fishing in the Snake River for cat fish. Although the memories fail me as far details go, I still remember the most important parts of the story. I am sure it was one of my first experiences with a fishing pole in my hands, so you can image I was not the caster or fisherman I am today. I remember the day being bright and sunny with just a slight breeze I believe blowing down river. We were using worms on the bottom and plunking in a way, by letting the worms lay on the bottom the cat fish would pick up the scent and come on over to investigate, ( I believe this is still a very effective way to catch big cats in the Snake ). As time went on throughout the day I don't recall catching any fish myself, although my brother had caught a nice 18" cat, and during the time when he was catching his fish is when the story of my first realization that fishing was a frustrating sport and that if I was going to make it as a fisherman I was going to have to learn how to deal with the rats nests and the bail failures, and the knots, and every little thing that comes along with a lifetime of fishing. Well I can tell you as I stood on the bank of the Snake river watching my brother catch a big cat and realizing that I had line wrapped around my hands, arm, legs, and the reel was a complete mess of line and knots. As I stood there crying and screaming for help as my brother called me cry baby and made fun of me, I realized this was not what I was made to do. Thankfully the years following I learned to deal with these adversities and I have overcome the challenges that all novices face, and I have come out of it a fairly good fisherman. This first encounter comes back to me time to time when I am having a bad day on the river, you know those days when every cast is a snag and you can't even move without hooking a tree or shrub that normally you wouldn't even notice was there, and it's then that I reflect back and remember that you never stop learning when it comes to fishing and even a professional can have a novice day on the river. I will sometimes just sit down when things are going bad and regroup and then with confidence head back out and start fishing. Confidence in your fishing ability and in the river or stream you are fishing is key to catching fish. If you go into it without the confidence that your fishing skills are good enough to catch fish then you will tend to give up to soon and not try everything you are capable of. In order to build this confidence you need to study the water in your river and find where the fish lay from one year to the next. Confidence comes from catching fish and also from knowing your fishing grounds and your gear. Using the correct gear may not give you the confidence to catch fish but it will make you feel more secure once you do hit that record fish that lingers in every fisherman's future casts. Enjoy your selfs out there and don't get to frustrated when you are having a bad day, if you need to just picture me as a 5 year boy standing on the banks of the Snake crying for help and feeling helpless in a sea of knots and line. Well to all those out there wanting to go fishing for Steelhead, I would suggest looking in the lower Sandy and Clackamas. In the lower Sandy now there are reports of some early summers being caught and the Springers should start to show up in the first of March and really kick off in April. The Sandy also has fish spread out through the system and they are mostly winters up near Dodge and up through the cedar creek area and above. If you have a drift boat, you can run the Sandy from the put in at Oxbow State park and float to the take out at Dabney State park. This is a fairly easy to novice run and the reports from the guides I have spoke with say they are still picking up some winters and a few summers, so if you have the chance this could be a opportunity to take advantage of. The cedar creek area is for those who don’t mind fishing with a lot of other guys that are looking for the same thing you are, (The one fish that hasn’t been hit the head)!. 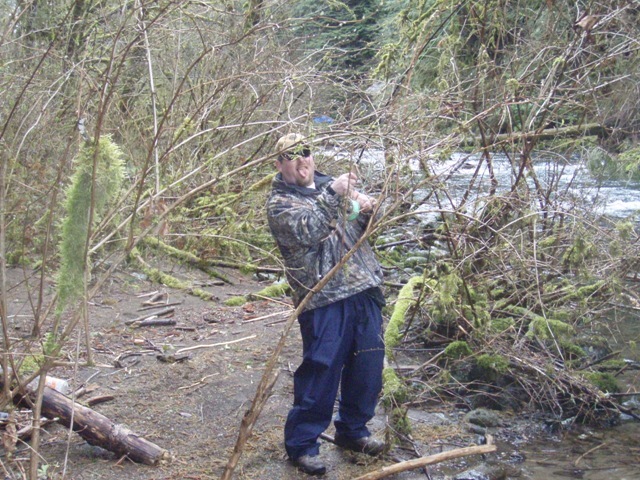 To all those die hard fly fisherman who enjoy fishing Eagle creek near Estacada, well I have grim news. This has been the worst year in 20 years that I have seen. On an average day this time of year in the past I would see 20 to 30 fish a day for the whole month of February and March, this year I am seeing about 0-1 fish a day. I have fished it nearly everyday last month, and I was there today. I saw no fish today and the water temp. is still way down from earlier years. I have not given up completely, but hope is wayning and I am almost ready to write it off. I will update the report on Eagle Creek next week, I am going to at least look at it once a week throughout March and hope that the natives show up in good numbers. 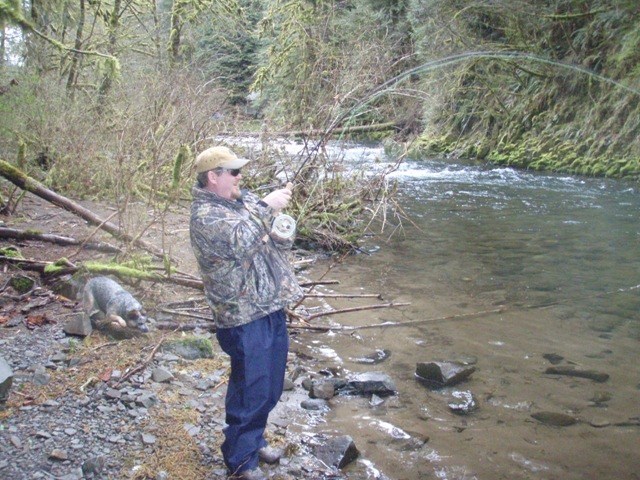 All in all the fishing is slow for the fly fisherman at this time when it comes to Steelhead. If you have the time head out the Crooked River right now for Rainbows and white fish. The River is open year round for the most part and the fish are always available for the taking, you may have to be alittle more persistent during the cold weather, but you can pick them up. The coastal rivers should start to pick up for Springers in the next month and should lead to some good fishing. Good luck to all out there and be carefull!! Remember to all those dog owners, Salmon poisoning is real and can kill. So if your dog gets into fish blood keep a close eye on them for 14 days, if they start to vomit or get listless then go to the vet and get antibiotics immediately. The pills will make them better fairly quickly. I don’t know exactly how to set up this thing for video but here is my first shot at it. Check out this nice fish. Click on the pic for the video! !